This is the shocking and probably (for some) frightening premise of the whole book and the powerful opening line is an indication of what’s to come for the next 240 pages. In essence the book is a potent look at industrial-scale change in the media and how we can understand and cope with it as a profession. Steve and Stephen set out these changes in the context of an amazing new online world view and chart the paths that have brought us to this exciting point in time. Although this detail can sound a bit forensic it’s treated with good humour and set out in a way that’s engaging and relevant beyond those working in PR and media. The authors assert that current PR methods haven’t changed much since the 1930s, but that factors affecting the media today could be just as seismic as the invention of the first printing press. Working as a PR in a local authority this really strikes a chord professionally but also comes as something of a double whammy. Councils have essentially worked the same way for the last hundred years or more but the current financial crisis is challenging us to think, deliver and communicate in innovative new ways. At its heart the book is about that fragile and nuanced relationship between brand and consumer. The central question is how we control and shape that in a complex new world that is constantly changing at break neck speed. 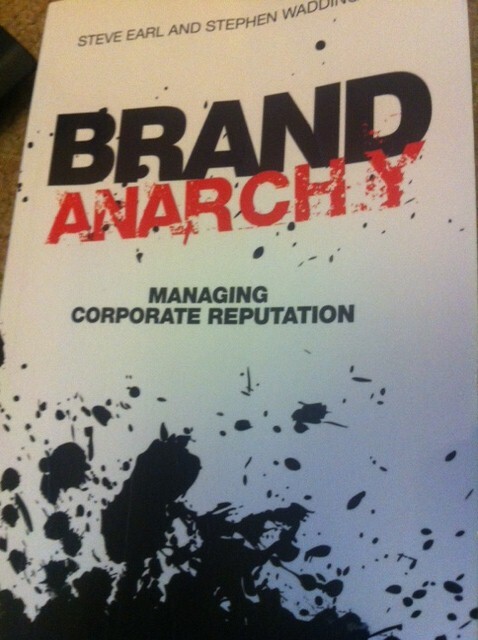 Less control is frightening for organisations, but this fear must not cripple communicators because according to Brand Anarchy it was only ever an illusion. It claims that PR as an industry is too concerned with crisis and needs to get on the front foot. Sure, the challenges posed by social media, the new online world and the decline of newsprint are difficult, but they are also truly exciting and the book has plenty of examples of this. But the danger is also clear for those who can’t or won’t adapt. PR is a middleman between people and brands, in a world where industry and publishing is increasingly looking to cut out the middle man. Although social media plays a major part in the book, the authors have no time for ‘self-interest’ evangelists who can’t see anything beyond digital. Although it doesn’t give any easy answers or quick fix solutions the text includes fascinating thoughts from some of the key media players of the past few decades. My generation had the web at university so have grown up with it and I think the impact has probably been undersold – “the web has broken every business model it’s touched” is another line that sticks in the mind. Skills are more important than ever, learn the art of conversation speak, the right language and be in the right place. Anyone who works in PR and marketing or is just interested in the evolution of the media must read this book. Disclaimer – my name does appear at the start of this book as an acknowledgement because some of the work we did in Northumberland is briefly mentioned. That’s excellent news. The review seems to get lots if traffic so people are obviously seeking it out. Great read so glad to hear so many are ‘getting it’.